Pumpkin Season is in full swing! Leaves are falling, sweaters and scarves are layered on, and fresh pumpkins wait to be carved into jack-o-lanterns! Houses are decorated inside and out as apple cider scented air wafts through open windows! 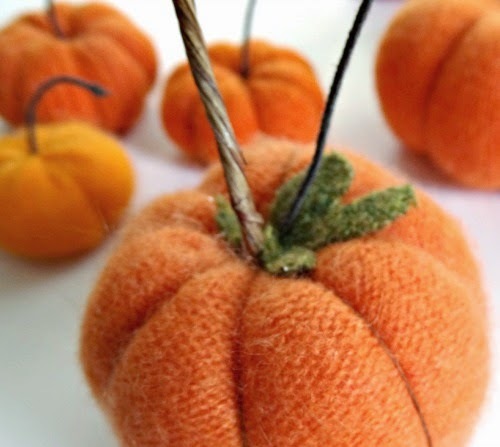 It's the perfect time to up-cycle old cashmere sweaters into sweet mini pumpkins! Cashmere sweaters are easy to find in thrift stores this time of year. Lambswool and Shetland wool sweaters also work well. 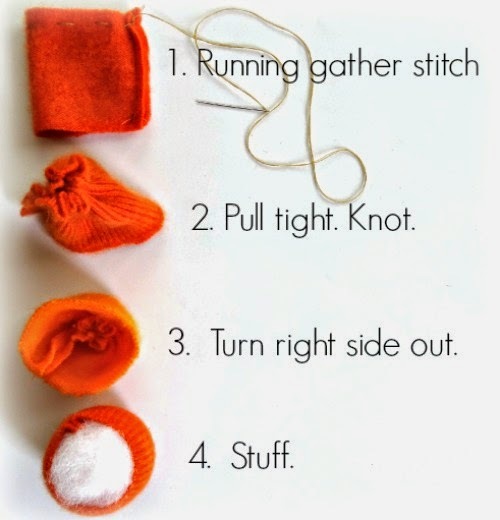 And don't stress if orange wools can't be found because hand-dying is easy- peasey. 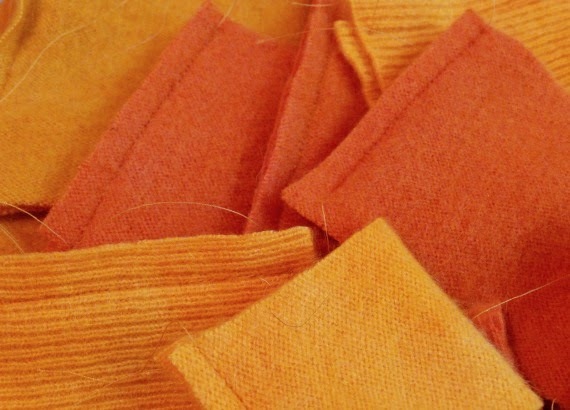 To prep the sweaters for crafting, machine wash and dry on high heat to felt the wool. If dying is necessary it should be done after felting. Prepare dye according to manufacturer's instructions. 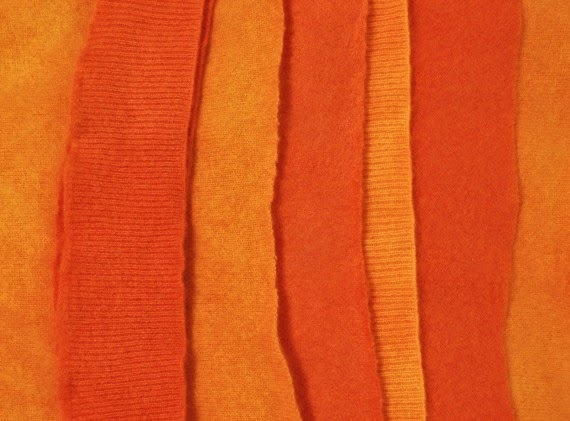 Cut the sweaters into strips and soak in the dye for approximately 15 minutes. 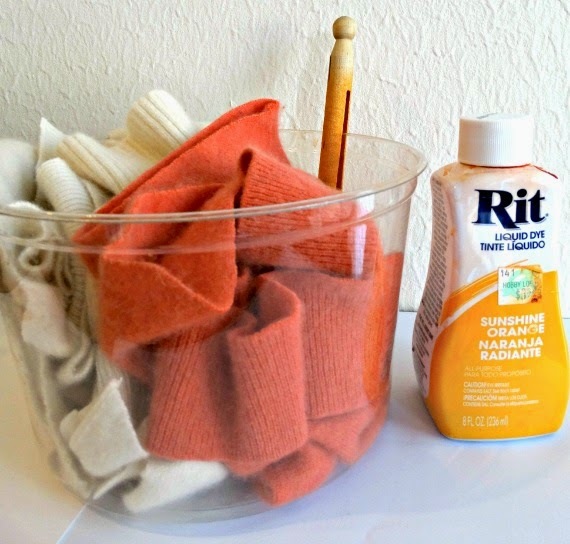 Rinse and set out in the sun to dry. I used a variety of beige and pink shaded sweaters and was rewarded with a nice variety in orange hues. Once the fabric is dry, press out the wrinkles with an iron on high heat. 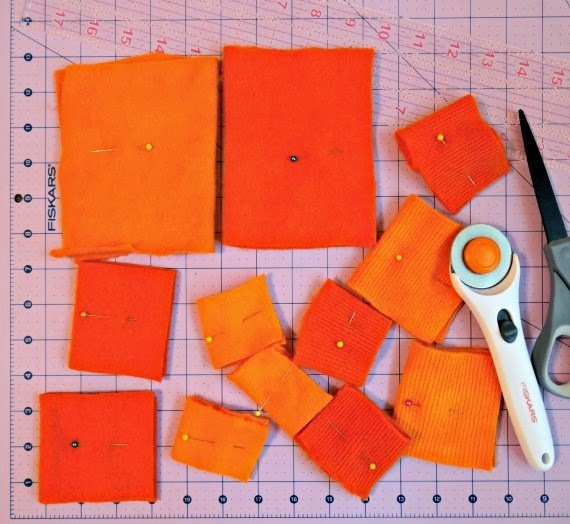 Cut strips into rectangles and squares ranging from 2 inches to 6 inches tall. This will create a nice variety in finished size and shape. Fold each piece in half, right sides together, and stitch side opposite the fold. Follow these eight simple steps for every pumpkin size. 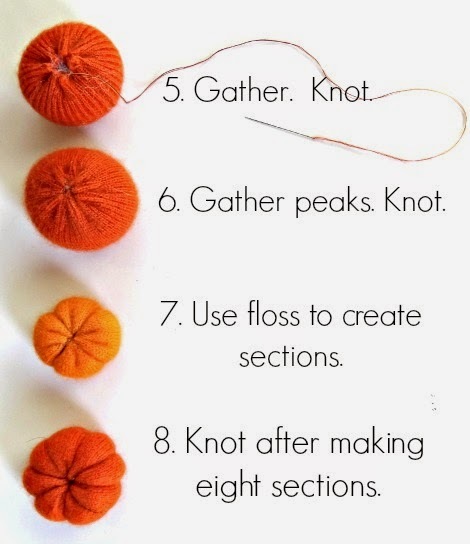 When creating the pumpkin sections (steps 7 and 8), start by anchoring floss at the top of the pumpkin and run floss down the outside of the pumpkin, bringing the needle back to the top by running it through the center of the pumpkin and repeating this action eight times. Time for toppers! 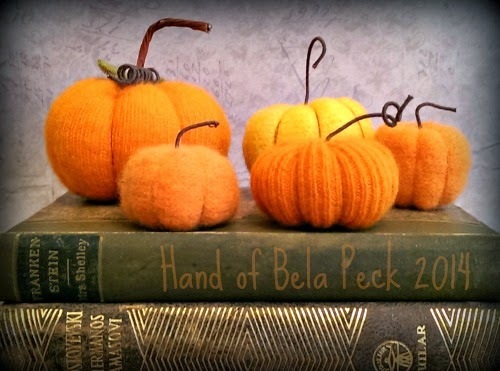 Wee pumpkins need only a simple stem of fabric wrapped floral wire. 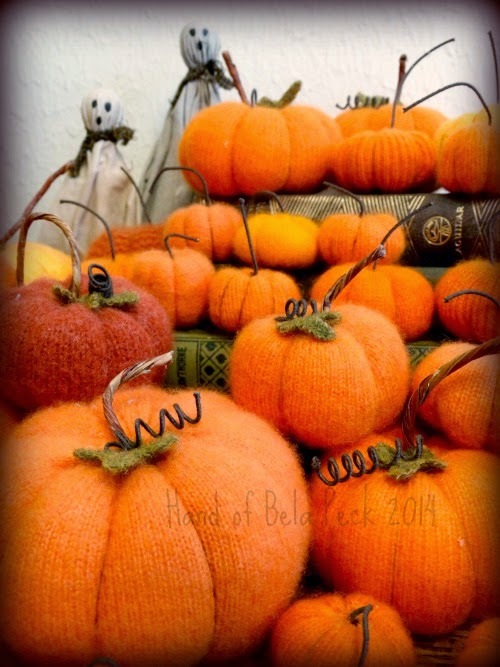 But for pumpkins 4 inches and larger the raffia-wrapped floral wire looks best accented with a wool leaf and curl. Using wire cutters, snip stems 1.5-2 inches long. 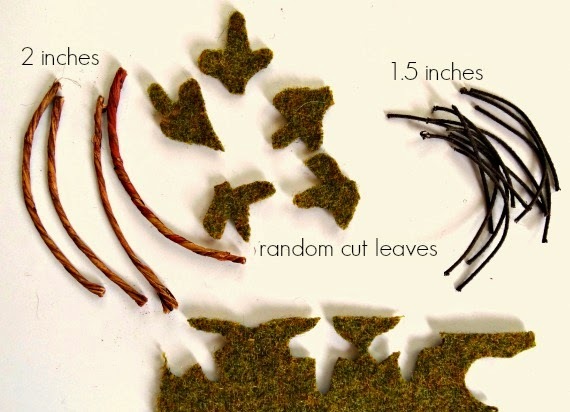 Leaves can be cut in random patterns for a touch of whimsy. Using the wire stem, wiggle the wire around the top center of the pumpkin to create a small hole where the stem will be inserted. Remove stem and apply a small dab of glue into the hole. Reinsert stem and set aside to dry. 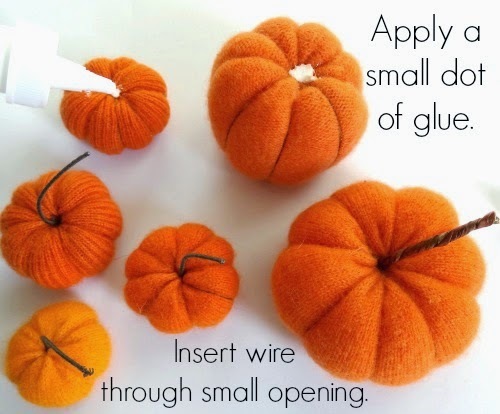 To apply leaves and curl to larger pumpkins, insert fabric wrapped wire alongside the raffia wrapped wire. Pierce leaf upon the thin wire and push it down to the stem base, pressing firmly into remaining glue. 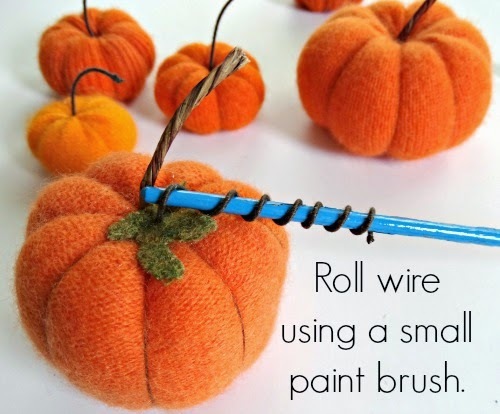 Use a thin paint brush end to wrap the wire, creating a curl. 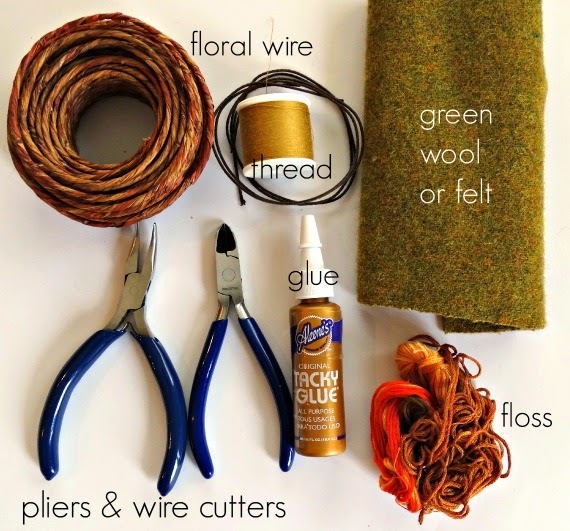 Use jewelry pliers to shape wire stems and curls as desired. Have fun! Get wildly creative! But use caution! This craft is so easy and cost-effective, it's easy to end up with an abundant harvest in just a few hours! To find gently used sweaters to up-cycle in your area simply Google search resale shops within your zip code.